We are sometimes asked for details of publications on the "overprinted Hitler" local issues in the immediate post-WWII period. The results follow; as always, comments corrections and amplifications are welcomed. The ANK [Netto] Österreich Spezialkatalog has a long listing (8 pages in the 2011-12 issue) of overprinted Hitlers from all over Austria. The list is extensive but other overprints are said to exist. Constant varieties are included, but due to the poor perforating of the sheets there are numerous fly speck errors caused by the confetti from the perforations falling out onto the plate while printing. "Many forgeries exist". The Michel catalogue has a similar list; Stanley Gibbons doesn’t. 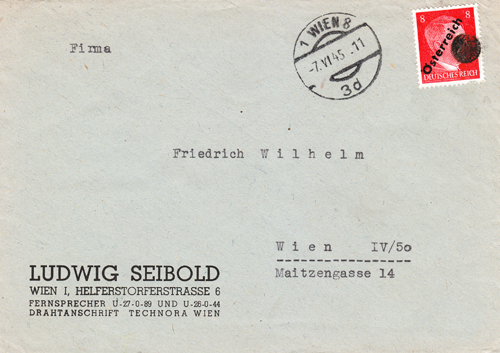 There’s a series of articles by Jim Syddall in some early issues of Austria. 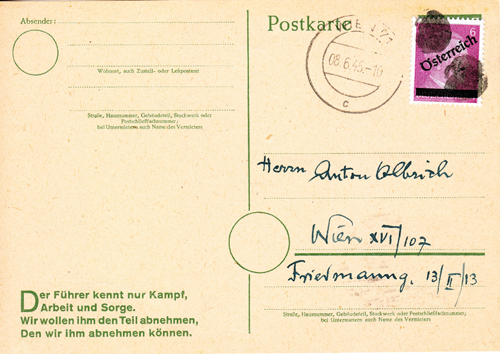 The overprints and their varieties are covered in issues 1-4; the Kleckstempels in 6-11; and the second overprint in 17. There is a specialist book on the 1945 posthorns by Dr. G. Goras; he has also written a book on the Russian zone eagle set. Lessig - Hochleutner - Pollak: "Emergency Cancels of Austria / Notstempel Österreichs 1945-1946". In German and English. There are some oldish articles by Sturzeis in Die Briefmarke, probably superseded by this book: Sturzeis - Zimmerl: "Österreich im Juni 1945 - Die Zeit der Klecksstempel". In German. 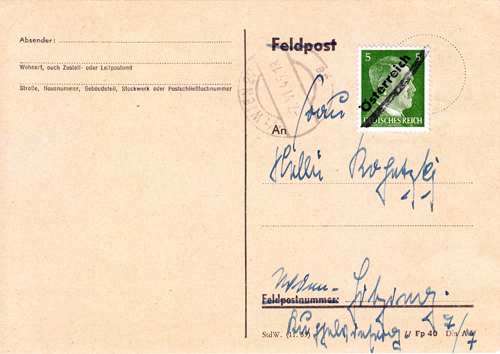 Left: the "Graz Panther" overprint, applied on 5 May 1945. Right: the "Tirol Eagle" from Hall in Tirol, applied in May 1945 and proscribed by the U.S. occupiers.